RePub, Erasmus University Repository: Are transcendental theories of justice redundant? Are transcendental theories of justice redundant? Amartya Sen’s The Idea of Justice is a very rich book, with many aspects worth discussing. I will limit myself here to one major claim that Sen makes, namely that transcendental theories of justice are redundant. I will argue that this ‘Redundancy Claim’ is mistaken, since for justice-enhancing actions we need both transcendental and non-transcendental theorising of justice. 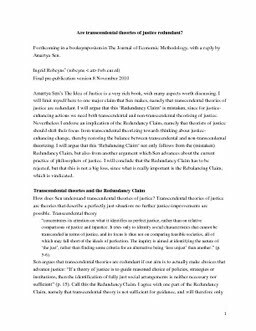 Nevertheless I endorse an implication of the Redundancy Claim, namely that theorists of justice should shift their focus from transcendental theorizing towards thinking about justice-enhancing change, thereby restoring the balance between transcendental and non-transcendental theorizing. I will argue that this ‘Rebalancing Claim’ not only follows from the (mistaken) Redundancy Claim, but also from another argument which Sen advances about the current practice of philosophers of justice. I will conclude that the Redundancy Claim has to be rejected, but that this is not a big loss, since what is really important is the Rebalancing Claim, which is vindicated.